Savvy Mumma: Chicken Soup - Great way to cure colds! 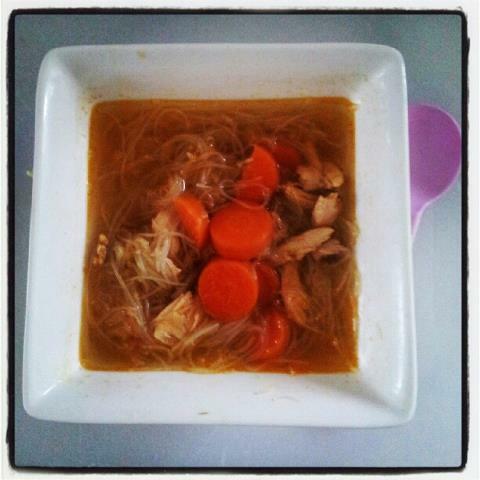 Chicken Soup - Great way to cure colds! I have been unwell so decided to make myself some chicken noodle soup. I am gluten intolerant so this is a gluten free recipe. Place the butter, onion, ginger and garlic in the bottom of the saucepan on low heat, and fry until golden brown but not crispy. Next add the chicken stock, carrots, chicken and corn. Bring to the boil then reduce to simmer on low until the carrots are soft or for about 10 minutes. Add the rice noodles and simmer gentle for a further 3 minutes to soften and cook the noodles. Once the noodles are cooked use a sharp knife to chop them up a bit to make the soup easy to eat. Lastly stir through the pepper and serve. The garlic, ginger and cayenne pepper in this recipe all help to clear colds and sore throats.